A few years ago, as most baby boomers passed age 50 and demands for 50-plus health care began to rise, Millcreek Community Hospital expanded its services to best serve the needs of this age group. Transitional Care. Transitional Care is designed to help senior patients return to their previous level of independence following surgery or illnesses that required inpatient hospitalization. Typical patients may have broken a bone in a fall or undergone joint replacement surgery and recovered enough to leave intensive care. Yet they may still need some level of care before they are ready to return home, often due to other medical conditions or concerns. Acute Care for the Elderly. Millcreek Community Hospital is the only area hospital to provide this level of inpatient care in what is called the ACE unit. 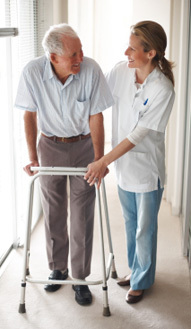 Staff members are trained in geriatric care and patients are given complete cognitive and physical assessments in addition to the specific medical treatment called for upon hospital admission. Both Transitional Care and the ACE unit are under the medical direction of fellowship-trained geriatrician James Y. Lin, D.O. Across the country, these levels of care have proven to be effective in reducing readmission rates for senior patients. Older Adult Behavioral Health Care. Comprehensive medical as well as evaluations of mood, behavior and emotional disturbances are provided to older adult patients via the Millcreek Community Hospital Emergency Department. Those determined to need hospitalization are cared for in a specialized, therapeutic 23 bed unit on hospital’s 2nd floor. The program provides the largest inpatient behavioral health facility for older adults in the region. A Partial Hospitalization Program is also available to those who need therapeutic support, but do not require hospitalization. Long-term Care. The LECOM Senior Living Center is a 138-bed skilled nursing facility connected to Millcreek Community Hospital, allowing for prompt and convenient medical care if needed for long-term care patients or those receiving just rehabilitation services.